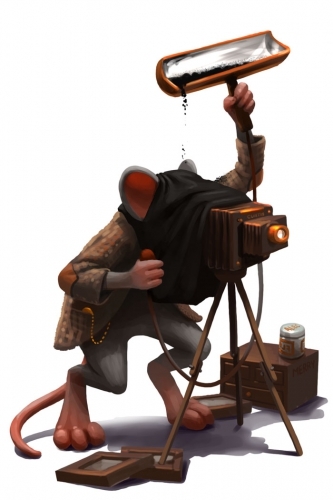 The Photographer Mouse is a breed of mouse found in the Gnawnian Express Station. They are known to drop a Minuscule Photo Album as loot. Say Cheese! This ambitious mouse is never without his camera equipment. He is not so different from hunters, in that he also tries to capture every mouse in Gnawnia; except on film! Some hunters who catch this mouse marvel at the photographs he sometimes has with him. Although too small to make out, hunters appreciate the opportunity just to see what the world is like through the eyes of a mouse! Truly, this is Gnawnian photography at its finest! Photographer mice have no specific preference for any kind of cheese. Law type traps such as S.L.A.C. are very effective against the Photographer Mouse. The Photographer Mouse drops the Gnawnian Express Egg during the annual Spring Egg Hunt. This page was last edited on 18 January 2016, at 02:39.